If you click Here you will see some of the pieces for the exhibition that I originally curated for The A + D Museum, on the official Getty website. 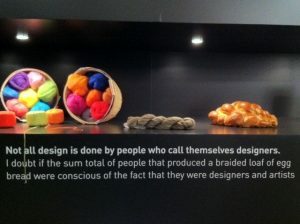 We had to modify my original concept, which was Eames quotes along side real Eames designs, an idea that is important because no one expressed better what they were working to achieve than Charles and Ray, and at A + D we focused on the Eames quotes themselves. All of those pieces on the Getty website, and 400 plus more, are on display here, at COLLECTING EAMES, another Getty exhibition. Finding a way to bring beauty to utility was a specialty of the Eameses and something they sought out in their day-to-day lives. The current exhibit at the A+D Museumin Los Angeles, EAMES WORDS — Eames Designs: The Guest Host Relationship, provides a unique and thoughtfully curated look into the way Charles and Ray Eames interpreted the world around them, finding beauty in utility. 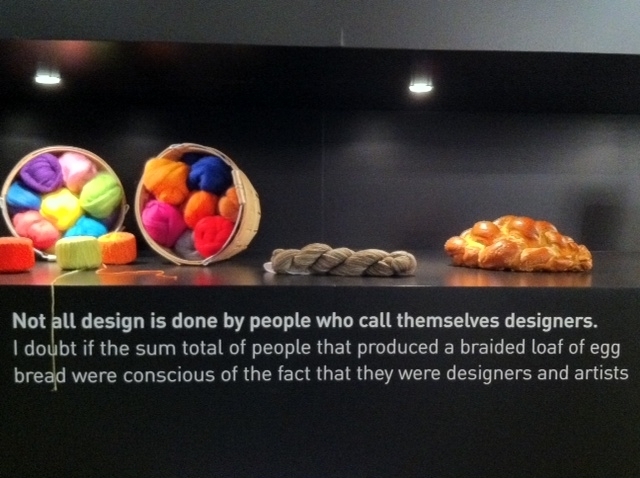 Their interpretations not only inspired their famous designs but shone a light on the extraordinary aspects of everyday objects — whether it’s the beautiful braided knots in egg bread or a simple kite, whose design success is solely determined by its ability to fly or not fly. Charles Eames viewed the role of a designer as that of a host, whose job was to determine the needs of his guest. The A+D exhibit makes Charles and Ray Eames hosts in the traditional sense of the word, inviting visitors into their world and allowing them to see it as they did. The exhibit is designed by Deborah Sussman, a longtime colleague and friend of the Eames’, together with graphic designer Andrew Byrom, architects (M)Archand many other contributors. It is a seemingly casually grouped collection of text and objects. The text consists mostly of quotes from Charles Eames — on walls, under exhibit pieces and on note cards — which playfully refer to the objects throughout the exhibit, whether it’s a sculptural grouping of scissors, toys or a bucket of nails. I won’t outline the exhibit in its entirety, because part of its joy is the sense of discovery and seeing objects anew. However, the Eames’ film essays are not to be missed — they are timeless and beautiful and their attention to the seemingly mundane makes life seem a little fresher and more whimsical. As a vehicle for visual interpretation, the exhibit could also be compared to George Nelson’s iconic book, “How to See.” In the book, Nelson outlines society’s problems with visual illiteracy and how to recognize common visual references in a man-made world. Ironically, Nelson — Herman Miller’s design director in the 40s — was responsible for bringing the Eameses to Herman Miller. Their shared sense of seeing the insignificant and identifying patterns is inspiring even today, which is why A+D should be applauded for taking this unusual look at Charles and Ray Eames. While the results of their design collaborations are truly extraordinary (many of their pieces are still in production today), the exhibit provides a rare glimpse into the quiet and personal space in which great design is created. 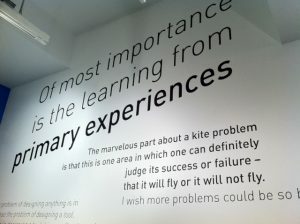 EAMES WORDS — Eames Designs: The Guest Host Relationship runs until January 16, 2012.